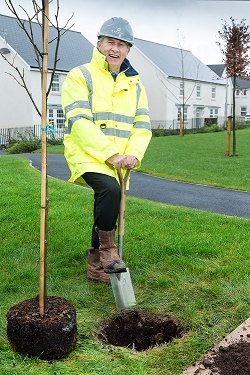 Barratt Homes in South Wales has celebrated National Tree Week with the planting of an oak tree to mark 8000 trees planted by the division in the last 12 months. “We have planted or retained more than 23,531 trees or shrubs at our developments throughout South Wales and wanted to mark our ongoing commitment to the environment,’’ said managing director Steve Williams. In addition to its tree planting programme the housebuilder incorporates features such as landscaping and planting guidance to create wildlife-friendly habitats across its developments in South Wales. The Tree Council’s National Tree Week takes place between 28 November and 6 December. It was founded in 1975 to make Britain more tree-conscious, encourage planting and raise awareness of the importance of proper care and maintenance of trees and has grown to become the UK’s largest celebration of trees.